There are few things as fickle as English weather and the 3 May 2015 was no exception. 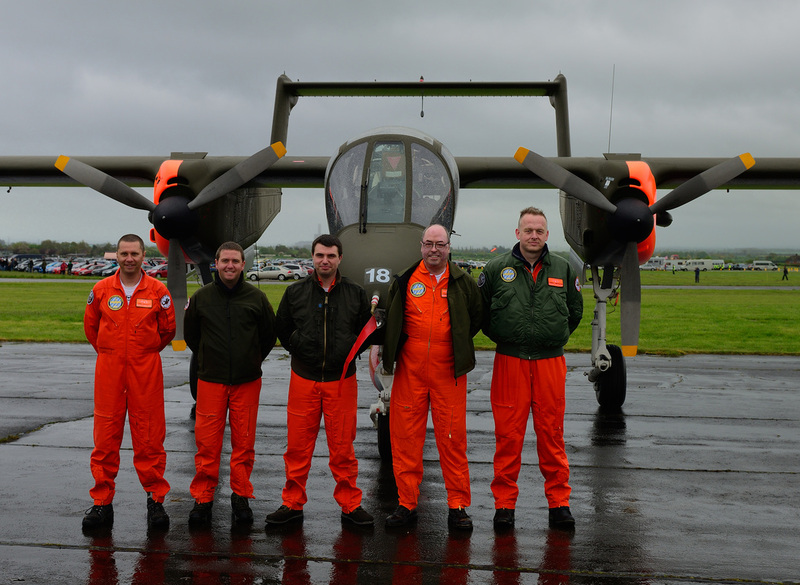 The much anticipated airshow held at Dalton Barracks started the day wet and continued that way on and off throughout the day. 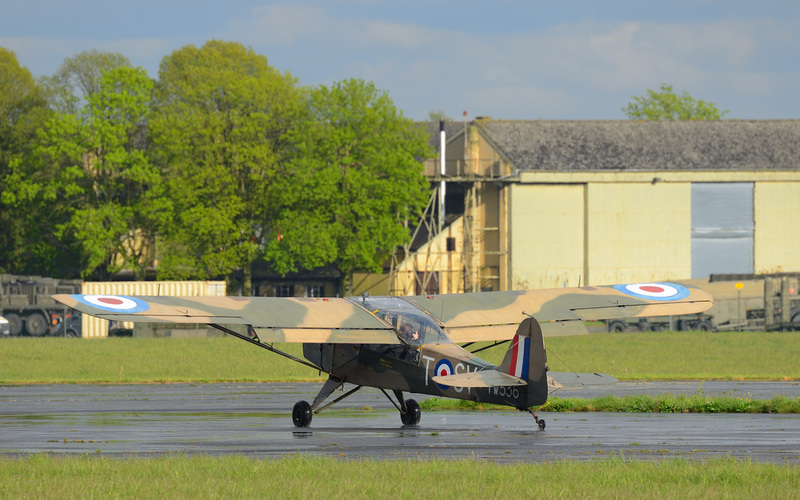 This led to some very trying conditions for Neil Porter, his team and aircrews alike. At times the weather brought back memories of the Last Lightning Airshow at RAF Binbrook in August 1987, where conditions were quite appalling but the show went on nonetheless. On the evening before the Airshow the static display was opened up for photographers to undertake a Night Shoot. The conditions were a bit on the breezy side but the rain did hold off before making an unwelcome appearance to dampen down proceedings. Images from the Night Shoot can be seen by clicking the link below. Such a reduction in performers would have usually seriously curtailed proceedings but as ever the Show's resourcefulness brought in a number of replacement acts. Before we look at the show an arrival for the static deserves mention. 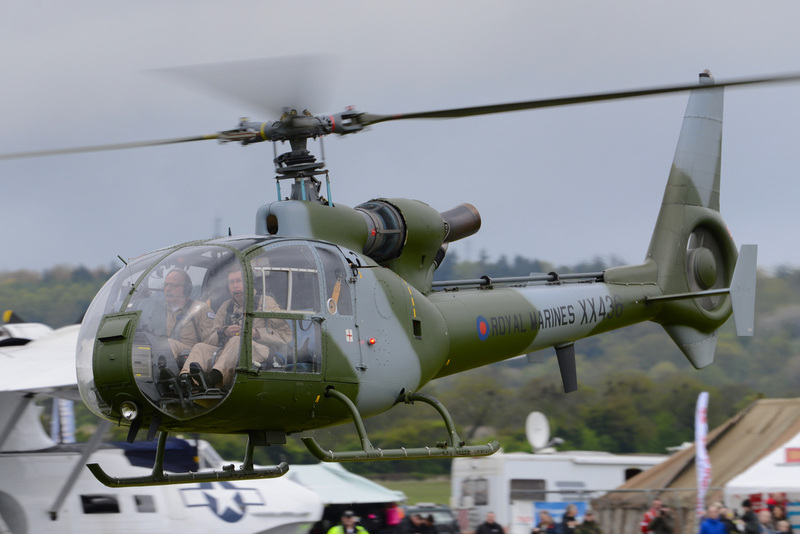 For some years now the Army Air Corps Historic Flight has been absent from the UK's display scene. 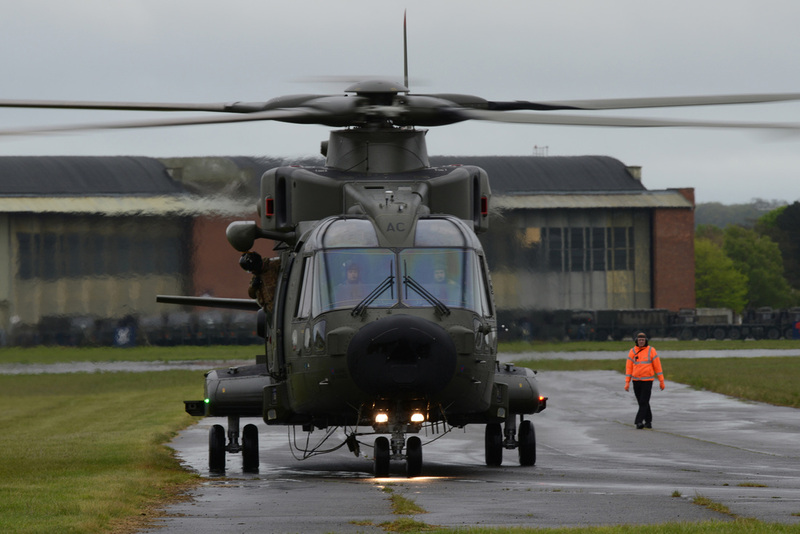 The reason for this was due to funding being removed by the MoD which has seen the Flight grounded. 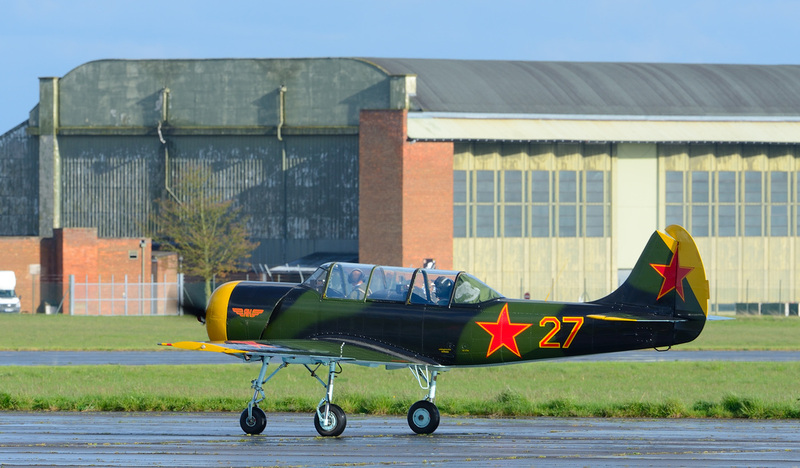 In February 2015 the Flight's aircraft were gifted to the Historic Aircraft Flight Trust (HAFT). 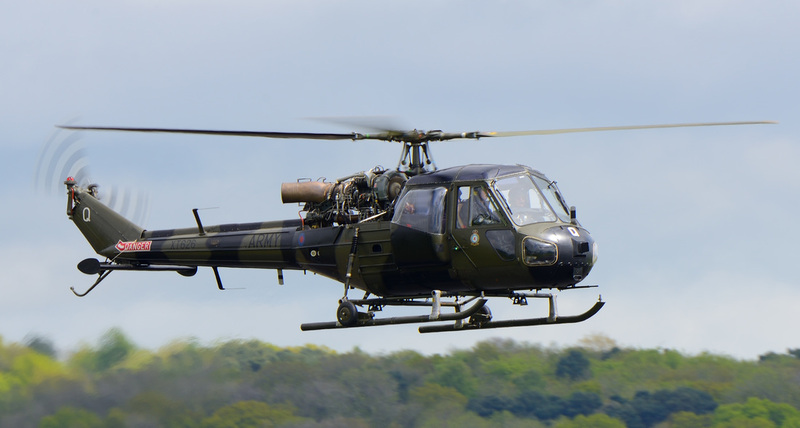 This has given the Flight's aircraft a new lease of life with one of them, Westland Scout AH.1 XT626 (left) flying into Abingdon 2015. Prior to the opening of the airshow proper a display by a T.55 main battle tank (right) took place. 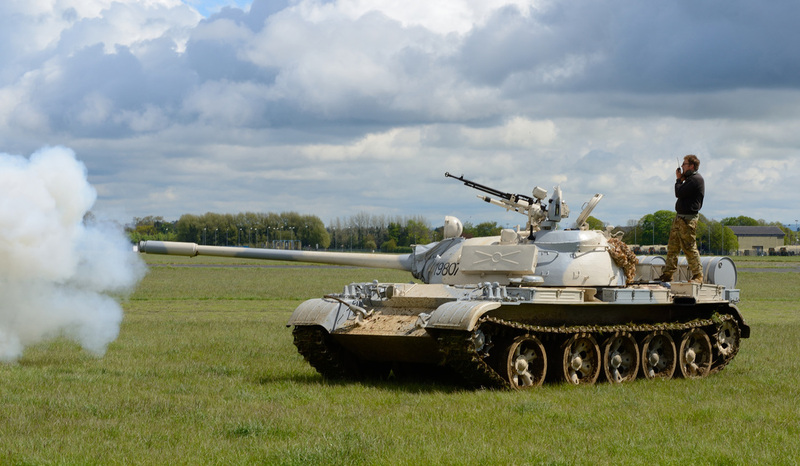 The tank took up its position at crowd centre where it was to fire its gun after a countdown at an armoured personnel carrier positioned some way down the airfield. The countdown didn't come but the gunfire did which made the crowd jump to say the least. Note the weather in this photo does not look too bad, this was however, to change. 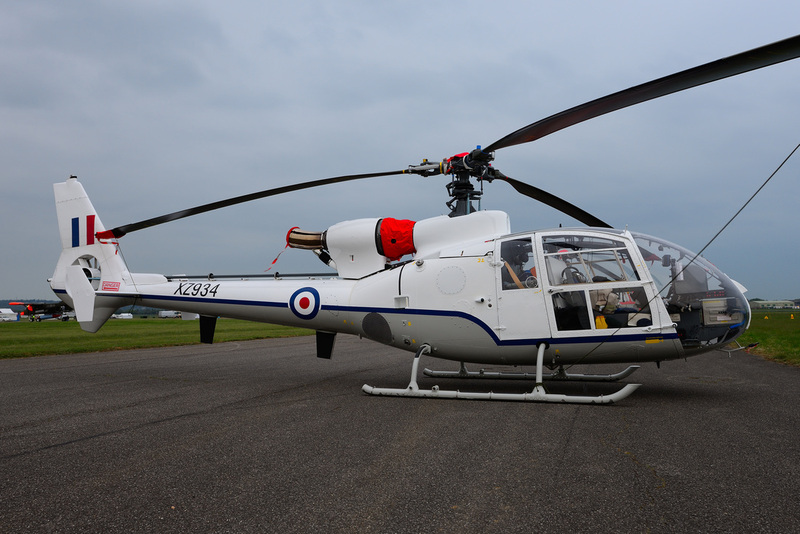 The primary aim of Abingdon's Air & Country Show is to raise funds for the Thames Valley Air Ambulance. This is a charity that receives no official funding and relies entirely on donations from the public and sponsors in the areas it serves. 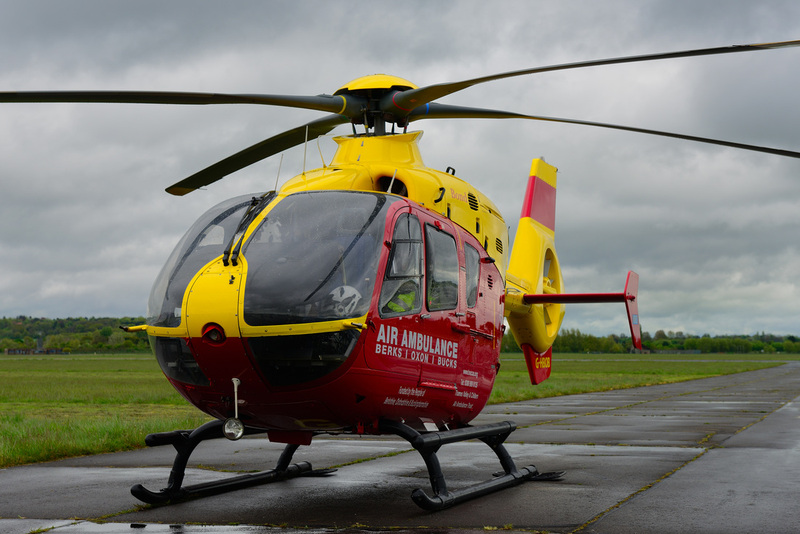 No one knows when they might want to receive life saving assistance from an Air Ambulance and the need for help to arrive in that "Golden Hour" is paramount. The airshow began at 13.30 with one of the replacement display acts arriving for their display. 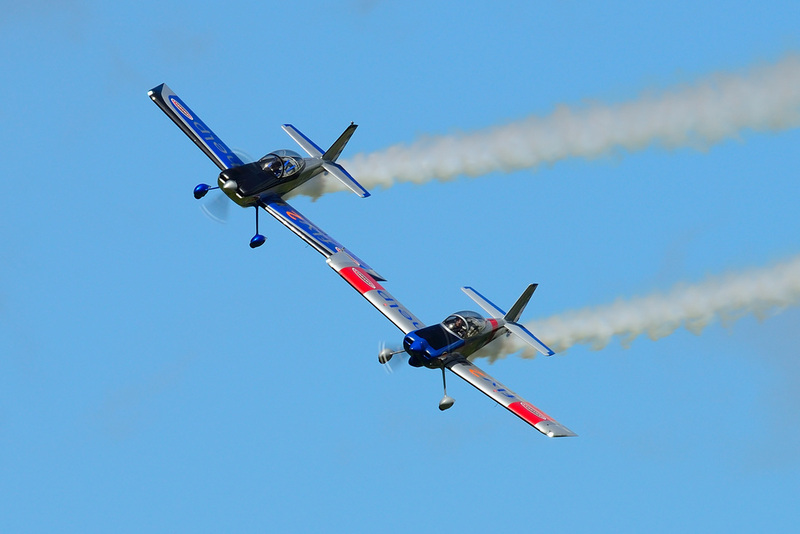 The RV8tors (left) fly kit built RV-8 aircraft in tight formation aerobatics. The RV-8 is a high performance aircraft that has two seats and is capable of pulling G to +6 -3. Top speed is in the region of 230mph. 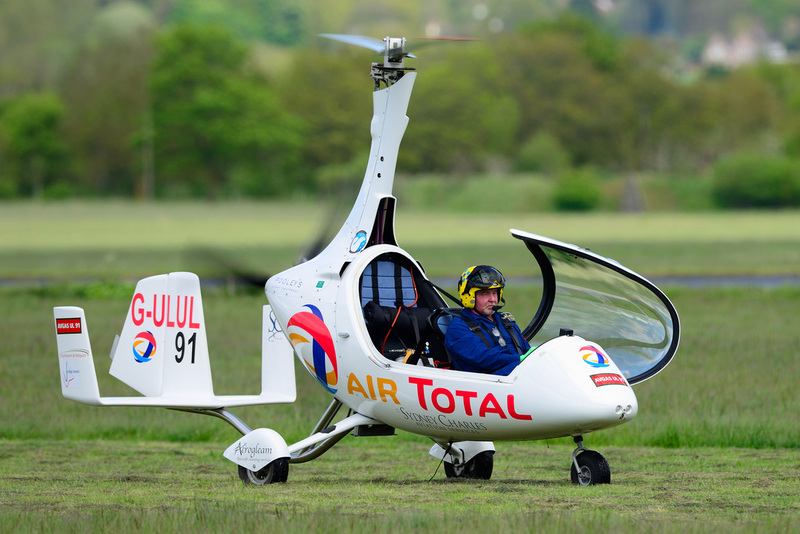 The Team consists of Alister Kay & Andy Hill a duo who between them have over 21,000 flying hours. 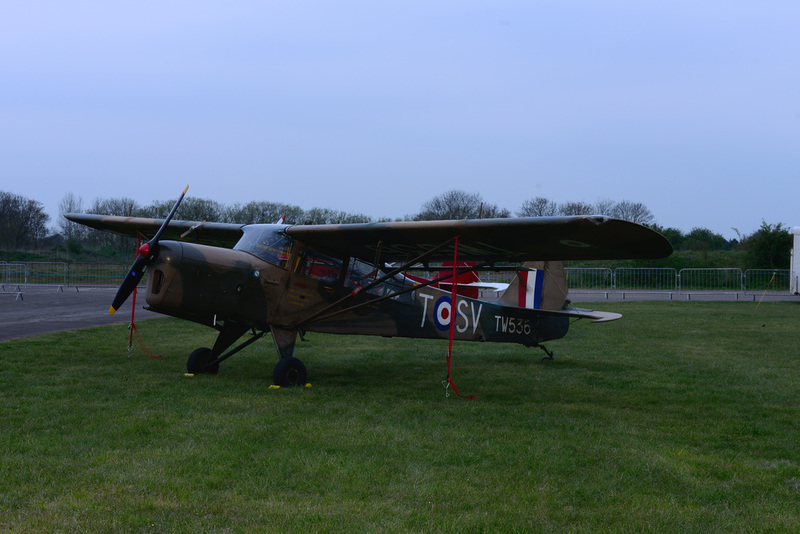 With skies beginning to darken from the West an aircraft that has often been seen in the static park at Abingdon took to the skies for a debut display. 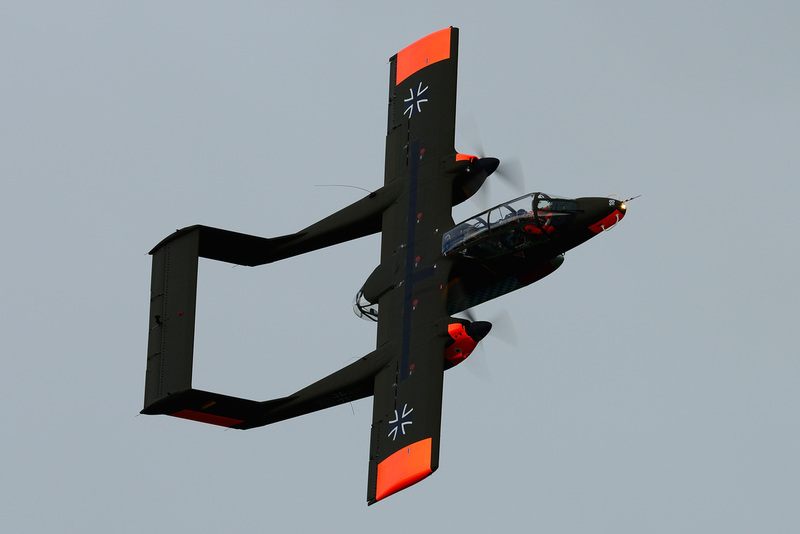 Bronco Team Demo's Rockwell OV-10B Bronco 99+18 (below) undertook a spirited routine in the capable hands of Tony De Bryn. Designed as a light attack and observation aircraft the Bronco has seen service with the US Air Force, Marines Corps, Navy and foreign powers including Columbia, Philippines, Thailand and Indonesia. 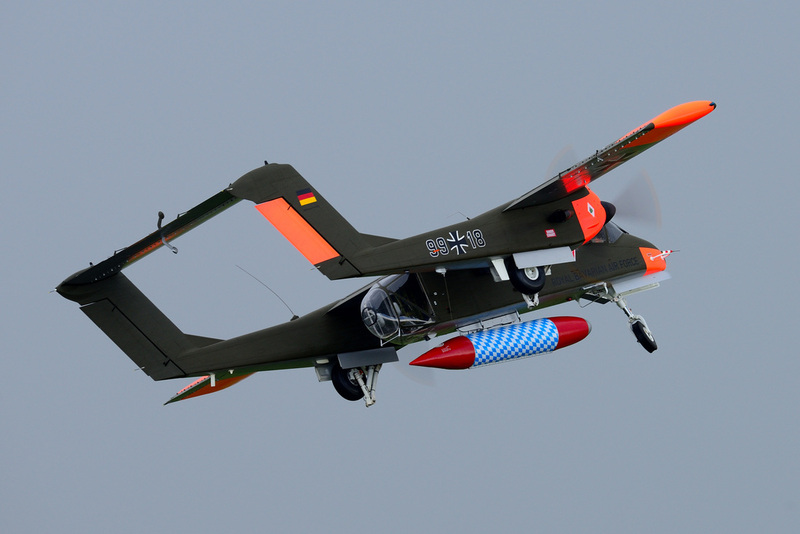 Team Bronco's OV-10B was flown by the German Luftwaffe as a target tug with the last of the type being retired in 1990. G-PIGY took off with the Renegades Parachute & Silver Star Display teams on board to position for a drop. Next to display was Rod Dean in his Scottish Aviation Bulldog T.1 XX543 (left). 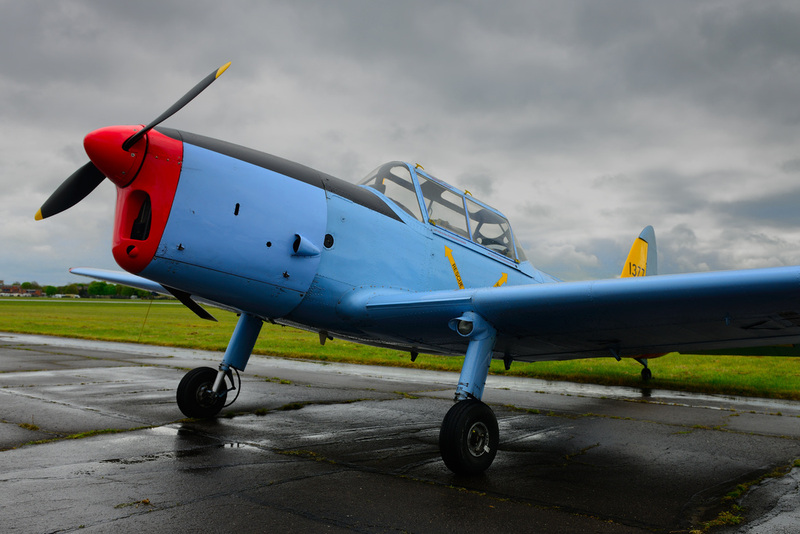 As ever Rod put the former RAF trainer through it paces in weather that was beginning to worsen with rain clouds gathering. 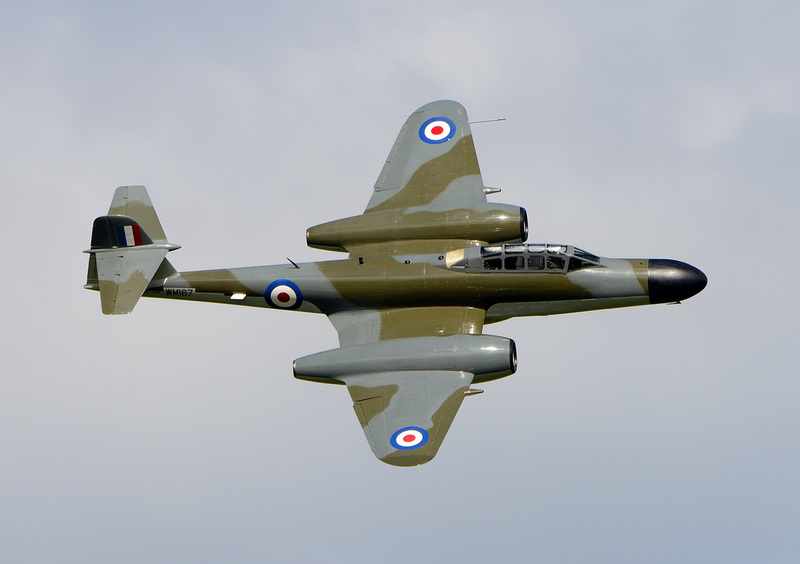 Rod has flown many hours in military and civilian aircraft and was at one time the RAF's Hunter Display Pilot. 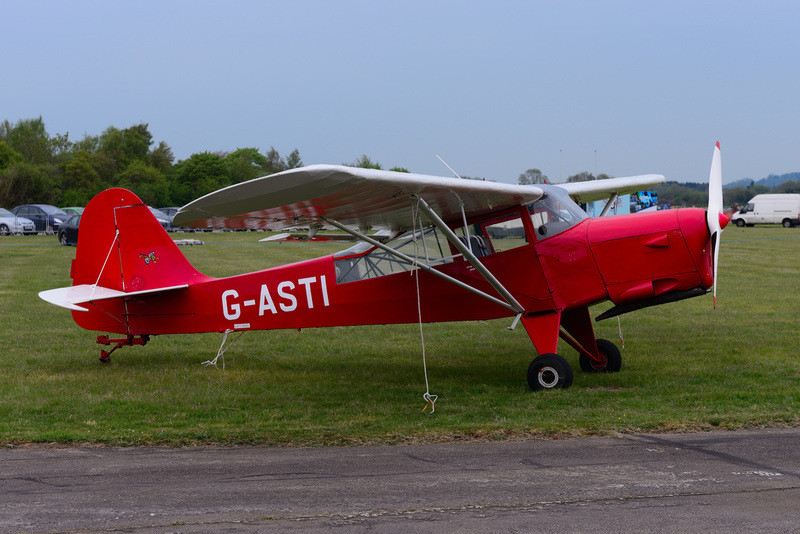 He has recently written a book entitled 50 Years Of Flying Fun, which has just been published by Grub Street. 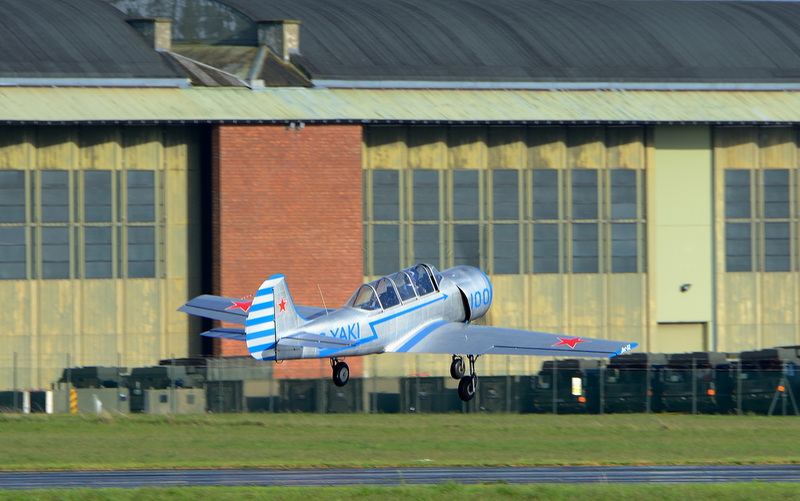 It was fitting to see a Bulldog again in Abingdon's sky as the type was based at the airfield in the 1970s/80s/early 90s with the Oxford & London University Air Squadrons. Following this, one of the more curious items on the airshow circuit began its display sequence. 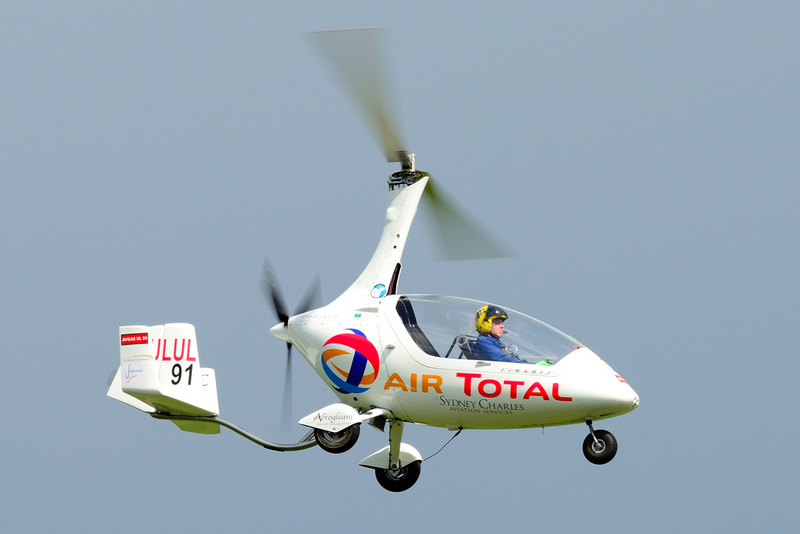 RotorSport Calidus Autogyro G-ULUL flown by Peter Davis of Gyro Air Displays, is something a bit different. 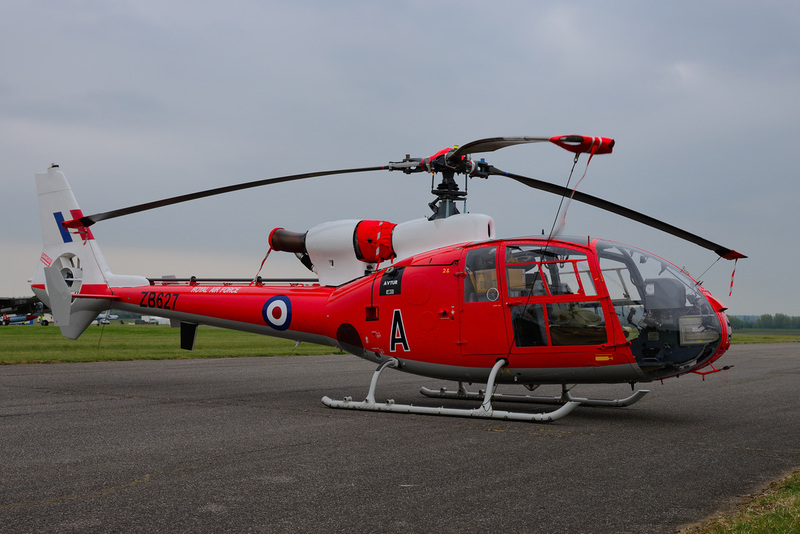 The display would to many evoke memories of the late great Wing Commander Ken Wallis, who was often to be seen flying his autogyros in UK skies. The routine was very spirited from this very small aerial craft and one which is hoped will be seen at more shows in the future. At this point anyone looking behind them to the West would have noted the very dark rain clouds which, at this point, decided it was time to march across Abingdon airfield. 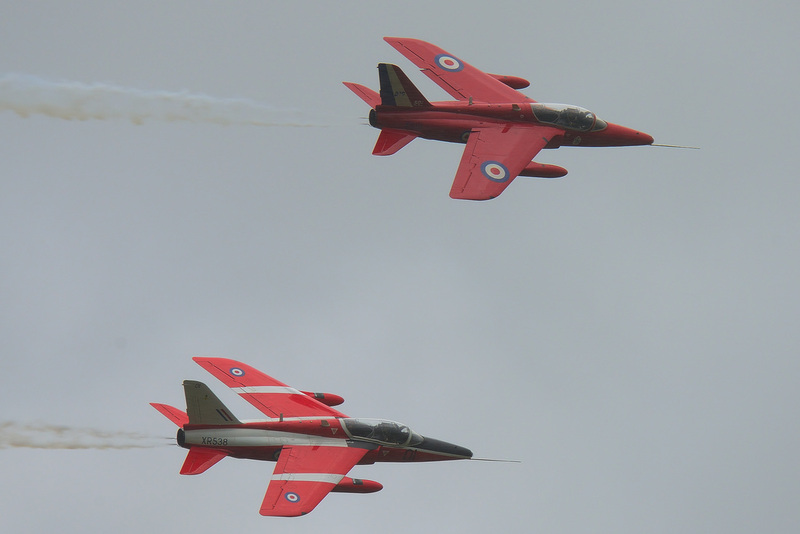 To coincide with this event the next display item called in, the Gnat Display Team (left). With very trying conditions prevailing the diminutive Gnats displayed and departed, and it looked as though the weather was about to get the better of the event. Looking around the assembled crowd it became evident that many were not willing to endure the persistent rain and were packing up to leave. In many ways they could not be blamed as there appeared to no let up on the horizon and the rain looked as though it had set in. From the author's perspective it was decided to give it to 4pm to see if it cleared, and surprisingly it did. When all appeared to be lost the weather again changed and the skies lightened. 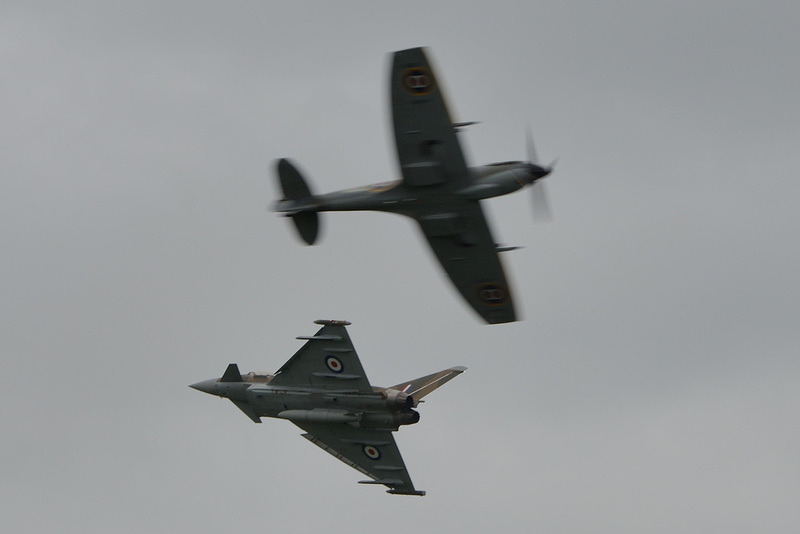 To see the Spitfire and Typhoon duo holding towards the West was an absolute revelation and meant a hastened effort to get back to the crowdline. 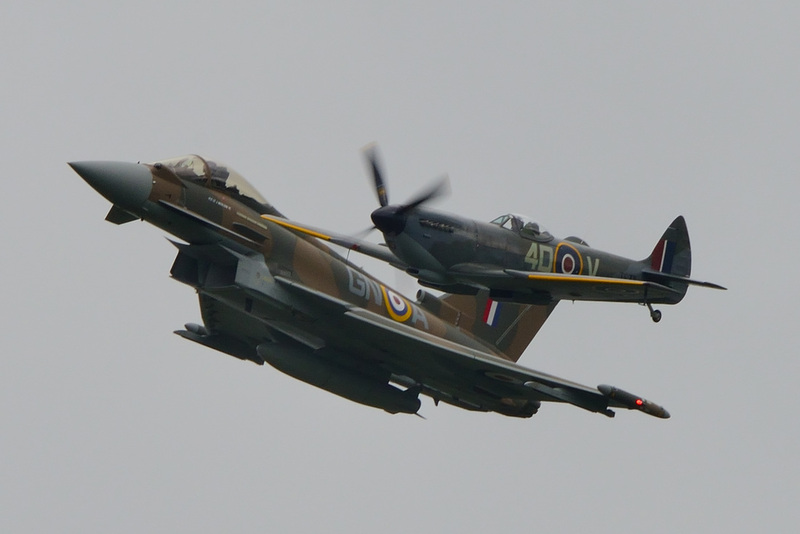 Abingdon was the public display debut for the duo that has been commissioned to commemorate the 75th anniversary of the Battle Of Britain and the pair certainly did not disappoint. Eurofighter Typhoon GR.4A ZK349 has been repainted in the scheme of Hawker Hurricane P3576 of No 249 Squadron that was flown by Flight Lieutenant J.B. Nicholson. The Spitfire in the duo is the Battle Of Britain Memorial Flight's MK Lf XVIe TE311, itself once based at Abingdon in the 1980's as a travelling exhibit with the RAF Exhibition Flight. On 16 August 1940 Red Section of No 249 Squadron was being led by Nicholson from Boscombe Down. In combat with Ju88's and Bf110's, Nicholson won Fighter Command's only Victoria Cross awarded during World War Two. With his Hurricane already in flames from being hit by gunfire from a Bf110, Nicholson was trying to bail out of the stricken aircraft when he saw another Bf110 cross his gunsight. Nicholson stayed in the Hurricane and kept pressing the firing button until the Bf110 was hit and dived away to destruction. Only then did he bail out but his ordeal did not end there, for on his descent he was fired at by members of the Home Guard. The Spitfire - Typhoon duo are easily going to be one of the highlights of this year's airshow scene with the pair putting on a polished routine that includes opposition passes and close formation flypasts. It is interesting to note that in 1985 at RAF Abingdon's Battle Of Britain At Home Day Airshow, a pairing of a Tornado F.2 and a Spitfire took to the skies to celebrate the 45th anniversary of the Battle Of Britain. WM167 is the only surviving airworthy example of a Meteor Night Fighter and was flown for this display by Jon Corley. The Meteor performed a number of topside passes which in the late afternoon sun gave superb lighting for the assembled photographers. It is a tribute to the Meteors owners, Classic Air Force, that this venerable jet is still flying into her 63rd year. 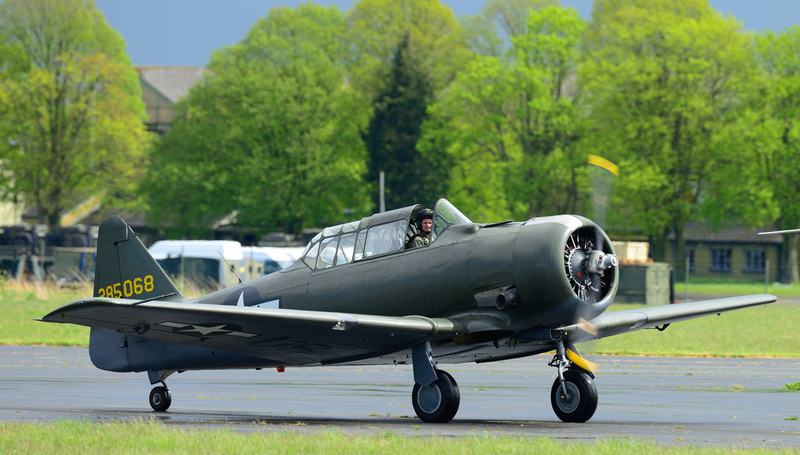 Following on from the Meteor's display the next item was Kennet Avaition's North American AT-6D Harvard III G-KAMY flown by Lt Commander Chris Gotke of the Royal Havy Historic Flight. Chris has recently been awarded an Air Force Cross for his airmanship and courage in landing Sea Fury T.20 VX281 at RNAS Culdrose following an engine failure in July 2014. With the weather that had been experienced on the day, full credit must go to the Battle Of Britain Memorial Flight for sending Douglas Dakota C.3 ZA947 (below left) to display. 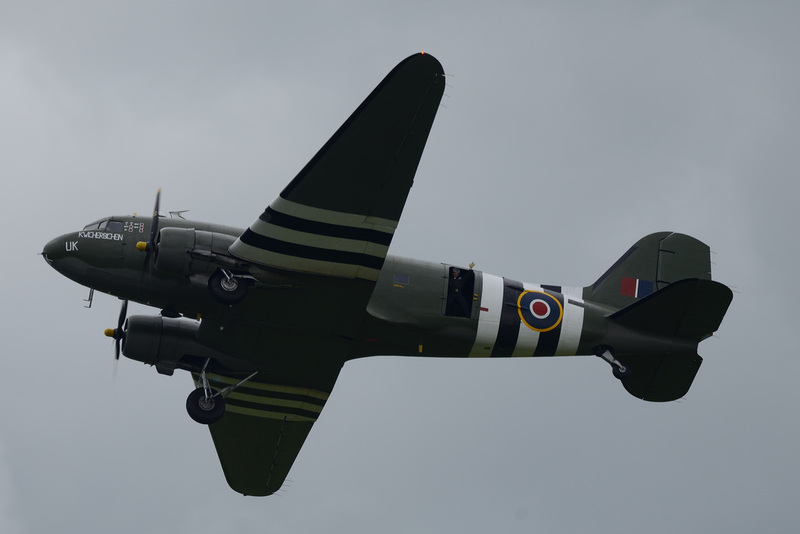 The skies again were darkening as the Dakota run through her routine, with the load master in the rear obviously enjoying himself and offering the crowd a cheery wave. 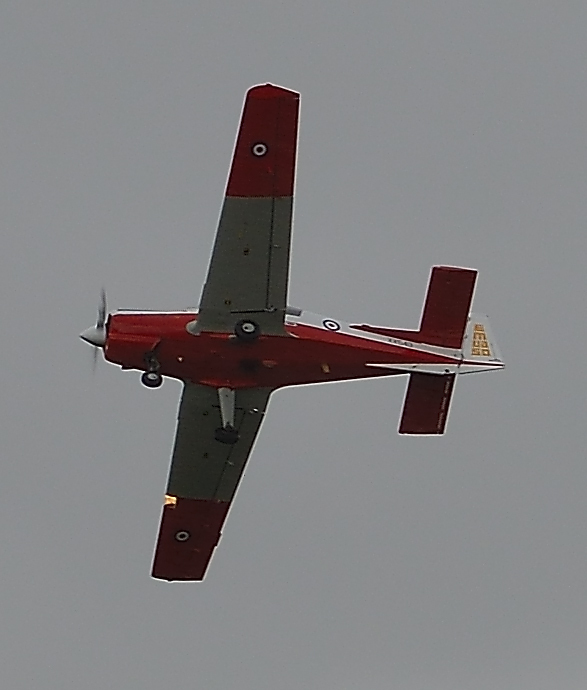 As more rain threatened the Twister Aerobatics Team undertook their display flying Silence SA1100 Twister aircraft. 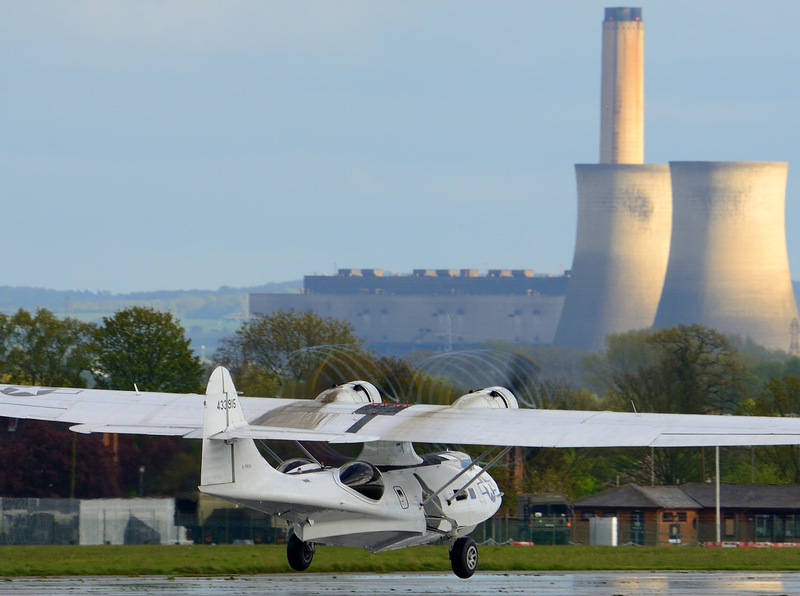 Next on the agenda was Plane Sailings Consolidated PBY-5A Catalina G-PBYA (below right) which returned to Abingdon having flown earlier to display at Old Warden's Season Premier Airshow. 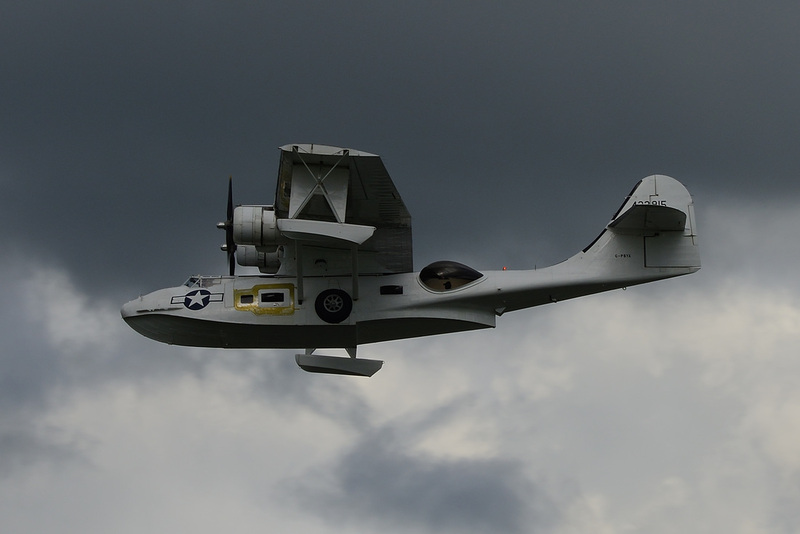 The Catalina's white colour scheme made an interesting contrast against the dark skies as the airshow began to draw to a close. It was quite a surprise to look to the South West to see the the shapes of a Spitfire and Hurricane holding for their display run in. 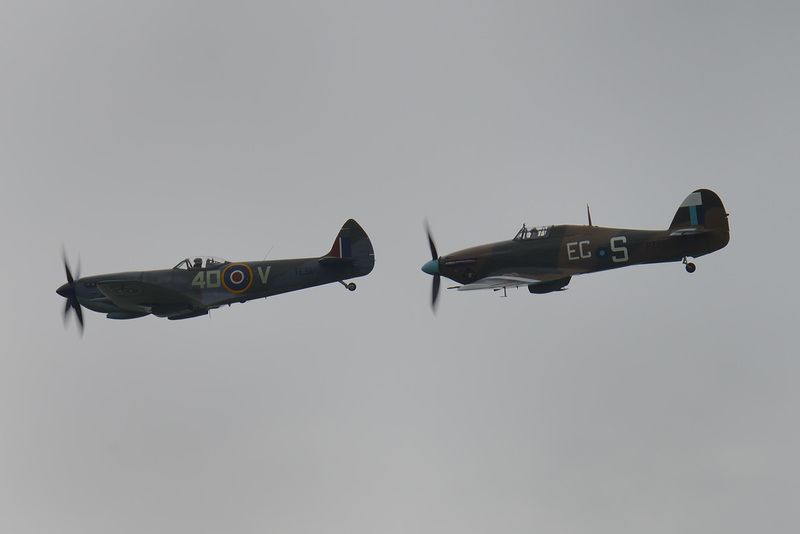 Few would have thought a couple of hours ago that there was any chance of seeing these two aircraft over Abingdon, but here they were doing what the British do best, snatching victory from the jaws of defeat. Hawker Hurricane MKIIc PZ865 joined Spitfire MK Lf XVIe TE311, which had previously displayed with the Typhoon as a truly fitting show finale. So that was a conclusion to a day of some very low points due to the weather and also some highs when in the end nature failed to defeat, on this occasion, the true spirit of the Great British Airshow. 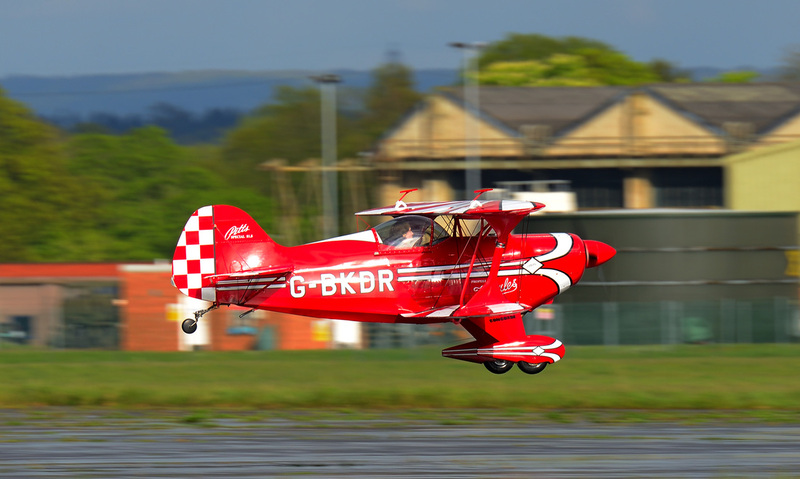 Full credit to Neil Porter and his Team for pulling this one out of the bag and here's looking forwards to next year's Abingdon Air & Country Show. With thanks to Paul Fiddian, Jo Ayres, Phil Whalley & Graham Summers for the superb company on the day.